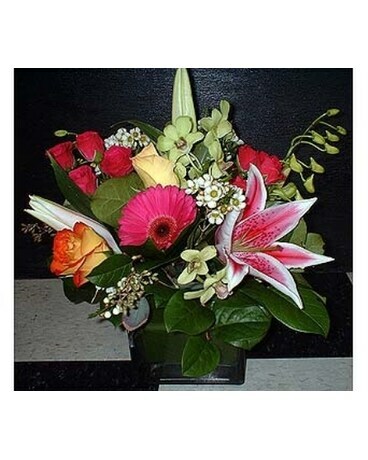 The Lovely Cube Mix is a design of Ecuadorian Roses, Orchids, Gerber Daisies, Spider Mums, and Ti Leaves. We make this in a short, thick-glassed cube vase. Very bright, very full, and very pretty! Perfect for a office or a home! 15707 Coit Rd Ste B at Arapaho Rd.